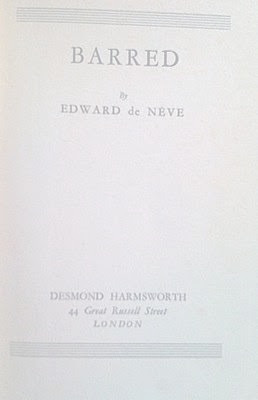 Edward de Neve. BARRED. Desmond Harmsworth, London 1932. The price, which I shall eventually reduce, is taken out of the air and owes some of its weight to the connection with 'Uncle Norman.' In a jacket it should be worth well into four figures. OUTLOOK? I have a feeling that Jean Rhys will at some point go up in value due to her Caribbean origins, the drama of her life and loves, her sheer talent and power and the fact she seems to still have some resonance even with the callow web3 generation. Another translation of hers, Carco's 'Perversity' (NY: Pacal Covici, 1928) is listed at $2500 for a decent copy in jacket. Well over twice what it should be (imnsho), but an interesting book as the translator is given as Ford Madox Ford but it is now known to have been entirely JR's work. Ford had involved himself in the translation project to such an extent that both Carco and the American publisher, Pascal Covici, thought Ford himself was the translator. The seller says: 'Rhys in this century is beginning to look like one of the truly great 20th Century novelists...' If he is right then prospects are good, but bear in mind that apart from the very rare 'Barred' and possibly her first book 'Postures', her books are not at present especially scarce. Please either ask for permission from the Agents of Jean Rhys, Sheil Land and Associates in London, or remove the photograph. E.R.Moerman, Director of Jean Rhys ltd.
Are the agents of Jean Rhys the ones who took the photo? do they own the copyright? If not, then perhaps the photo should be restored. Many thanks Edith-- in these lonely four years I have found a partner tied the knot and settled into uxorious bliss so the deal is off (very reluctantly). I do have a friend however...literary type, but broke. To those who have too little time to be courteous or seek to respond insultingly, the lines you wrote took more time than the two words "thank you" or a smile. La Santé had at least one earlier, world famous guest: the abbé Prévost's Manon Lescaut. The copyright in Ed de Nève's In de strik (the original Dutch and in his own translation thereof into French is the property of E.R.Moerman. The copyright in Barred, Jean Rhys's translation of Sous les verrous into English is held by Jean Rhys Ltd.
Young England. The worst play ever?